I’m not going to lie. I didn’t make this casserole myself. I had planned to do it alone, but I ended up having a late meeting and didn’t get home in time. Mike picked up the slack and cooked the casserole for me. Usually Mike does all the cooking anyway, so I don’t think he minded. In fact, he told me that he wants to go back to doing all the cooking especially the main dishes. Even though I’ve been having fun with this, I don’t really mind giving that up. Preheat oven to 350F. Spray a baking dish non-stick spray. 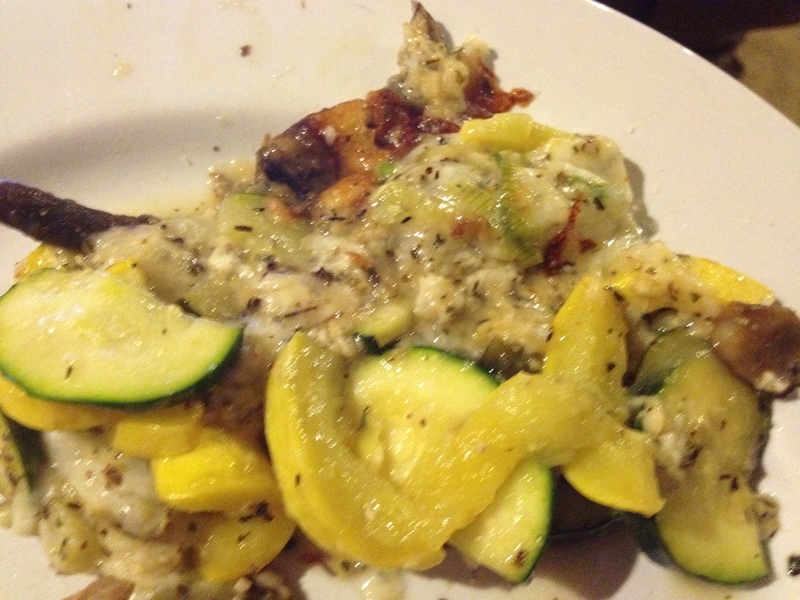 Cut zucchini, squash, and mushrooms into slices. Chop basil into tiny pieces. Slice green onions. Combine the sliced squash, zucchini, mushroom, chopped basil, sliced green onions, dried thyme, garlic powder, and both kinds of cheese and stir together until everything is mixed. Season with salt and fresh ground black pepper. Put the mixture in the baking dish and bake uncovered for about 25-30 minutes. 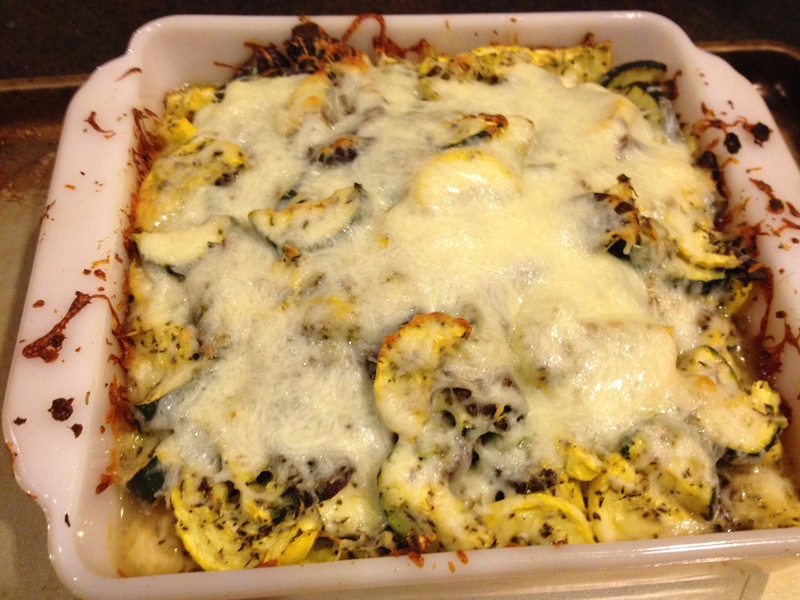 When the zucchini is nearly cooked through, take the casserole dish out of the oven and sprinkle over the remaining 1/2 cup of grated cheese. Put the dish back in the oven and bake for another 10-15 minutes, or until the cheese is melted and browned, (if you like cheese that way). Serve hot. This was really good. I didn’t think it had enough salt, so I added more. Overall, this is a great side dish to any meal! Happy eating!! If Mike cooks the main dishes, they’ll probably make the average meal taste like a Thanksgiving feast. I love that Mike is over you doing the cooking and seems to have politely asked you to stop. Looks tummy! I will have to try this, thanks for sharing!